Summary of climate change impacts. Projected global warming in 2100 for a range of emission scenarios. This article breaks down some of the impacts of climate change according to different levels of future global warming. This way of describing impacts has, for instance, been used in the IPCC (Intergovernmental Panel on Climate Change) Assessment Reports on climate change. The instrumental temperature record shows global warming of around 0.6 °C during the 20th century. In the IPCC Fourth Assessment Report, changes in future global mean temperature were projected using the six SRES "marker" emissions scenarios. 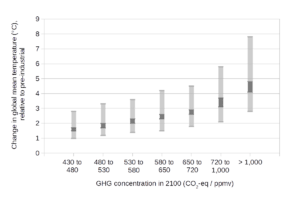 Emissions projections for the six SRES "marker" scenarios are representative of the full set of forty SRES scenarios. For the lowest emissions SRES marker scenario ("B1" - see the SRES article for details on this scenario), the best estimate for global mean temperature is an increase of 1.8 °C (3.2 °F) by the end of the 21st century. 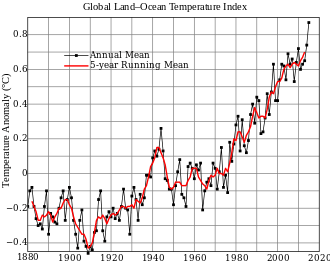 This projection is relative to global temperatures at the end of the 20th century. The "likely" range (greater than 66% probability, based on expert judgement) for the SRES B1 marker scenario is 1.1–2.9 °C (2.0–5.2 °F). For the highest emissions SRES marker scenario (A1FI), the best estimate for global mean temperature increase is 4.0 °C (7.2 °F), with a "likely" range of 2.4–6.4 °C (4.3–11.5 °F). The range in temperature projections partly reflects (1) the choice of emissions scenario, and (2) the "climate sensitivity". :22–24 For (1), different scenarios make different assumptions of future social and economic development (e.g., economic growth, population level, energy policies), which in turn affects projections of greenhouse gas (GHG) emissions. :22–24 The projected magnitude of warming by 2100 is closely related to the level of cumulative emissions over the 21st century (i.e. total emissions between 2000-2100). The higher the cumulative emissions over this time period, the greater the level of warming is projected to occur. (2) reflects uncertainty in the response of the climate system to past and future GHG emissions, which is measured by the climate sensitivity). :22–24 Higher estimates of climate sensitivity lead to greater projected warming, while lower estimates of climate sensitivity lead to less projected warming. Projections suggest changes in the frequency and intensity of some extreme weather events. Confidence in projections varies over time. The impacts of extreme events on the environment and human society will vary. Some impacts will be beneficial—e.g., fewer cold extremes will probably lead to fewer cold deaths. Overall, however, impacts will probably be mostly negative. A map that shows ice concentration on 16 September 2012, along with the extent of the previous record low (yellow line) and the mid-September median extent (black line) setting a new record low that was 18 percent smaller than the previous record and nearly 50 percent smaller than the long-term (1979-2000) average. Solomon et al. (2007) assessed the potential impacts of climate change on summertime Arctic sea ice extent. Assuming high growth in greenhouse gas emissions (SRES A2), some models projected that Arctic sea ice in the summer could largely disappear by the end of the 21st century. More recent projections suggest that the Arctic summers could be ice-free (defined as ice extent less than 1 million square km) as early as 2025-2030. 2. The ocean have also acted as a sink in absorbing extra heat from the atmosphere. :4 The increase in ocean heat content is much larger than any other store of energy in the Earth’s heat balance over the two periods 1961 to 2003 and 1993 to 2003, and accounts for more than 90% of the possible increase in heat content of the Earth system during these periods. 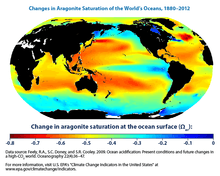 This map shows changes in the amount of aragonite dissolved in ocean surface waters between the 1880s and the most recent decade (2003-2012). Historical modeling suggests that since the 1880s, increased CO2 has led to lower aragonite saturation levels (less availability of minerals) in the oceans around the world. The largest decreases in aragonite saturation have occurred in tropical waters. However, decreases in cold areas may be of greater concern because colder waters typically have lower aragonite levels to begin with. About one-third of the carbon dioxide emitted by human activity has already been taken up by the oceans. As carbon dioxide dissolves in sea water, carbonic acid is formed, which has the effect of acidifying the ocean, measured as a change in pH. The uptake of human carbon emissions since the year 1750 has led to an average decrease in pH of 0.1 units. Projections using the SRES emissions scenarios suggest a further reduction in average global surface ocean pH of between 0.14 and 0.35 units over the 21st century. The effects of ocean acidification on the marine biosphere have yet to be documented. Laboratory experiments suggest beneficial effects for a few species, with potentially highly detrimental effects for a substantial number of species. With medium confidence, Fischlin et al. (2007) projected that future ocean acidification and climate change would impair a wide range of planktonic and shallow benthic marine organisms that use aragonite to make their shells or skeletons, such as corals and marine snails (pteropods), with significant impacts particularly in the Southern Ocean. Trends in global average absolute sea level, 1870-2008. There is a widespread consensus that substantial long-term sea level rise will continue for centuries to come. In their Fourth Assessment Report, the IPCC projected sea level rise to the end of the 21st century using the SRES emissions scenarios. Across the six SRES marker scenarios, sea level was projected to rise by 18 to 59 cm (7.1 to 23.2 in), relative to sea level at the end of the 20th century. Thermal expansion is the largest component in these projections, contributing 70-75% of the central estimate for all scenarios. Due to a lack of scientific understanding, this sea level rise estimate does not include all of the possible contributions of ice sheets (see the section on Greenland and West Antarctic Ice sheets). With very high confidence, Rosenzweig et al. (2007) concluded that physical and biological systems on all continents and in most oceans had been affected by recent climate changes, particularly regional temperature increases. Impacts include earlier leafing of trees and plants over many regions; movements of species to higher latitudes and altitudes in the Northern Hemisphere; changes in bird migrations in Europe, North America and Australia; and shifting of the oceans' plankton and fish from cold- to warm-adapted communities. The Arctic, Africa, small islands and Asian megadeltas are regions that are likely to be especially affected by climate change. Low-latitude, less-developed areas are at most risk of experiencing negative impacts due to climate change. Developed countries are also vulnerable to climate change. For example, developed countries will be negatively affected by increases in the severity and frequency of some extreme weather events, such as heat waves. In all regions, some people can be particularly at risk from climate change, such as the poor, young children and the elderly. 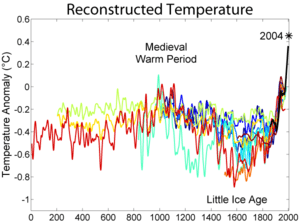 The projections above can be expressed relative to pre-industrial (1750) temperatures. 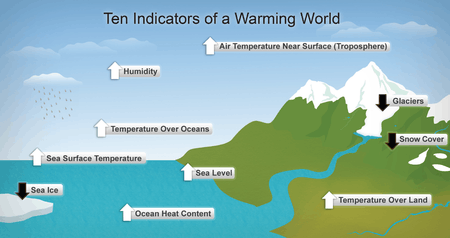 0.6 °C of warming is estimated to have occurred between 1750 and 1990-2000. Add 0.6 °C to the above projections to convert them from a 1990-2000 to pre-industrial baseline. Easterling et al. (2007) assessed studies that made quantitative projections of climate change impacts on food security. It was noted that these projections were highly uncertain and had limitations. However, the assessed studies suggested a number of fairly robust findings. The first was that climate change would likely increase the number of people at risk of hunger compared with reference scenarios with no climate change. Climate change impacts depended strongly on projected future social and economic development. Additionally, the magnitude of climate change impacts was projected to be smaller compared to the impact of social and economic development. In 2006, the global estimate for the number of people undernourished was 820 million. Under the SRES A1, B1, and B2 scenarios (see the SRES article for information on each scenario group), projections for the year 2080 showed a reduction in the number of people undernourished of about 560-700 million people, with a global total of undernourished people of 100-240 million in 2080. By contrast, the SRES A2 scenario showed only a small decrease in the risk of hunger from 2006 levels. The smaller reduction under A2 was attributed to the higher projected future population level in this scenario. Human beings are exposed to climate change through changing weather patterns (temperature, precipitation, sea-level rise and more frequent extreme events) and indirectly through changes in water, air and food quality and changes in ecosystems, agriculture, industry and settlements and the economy (Confalonieri et al., 2007:393). According to an assessment of the scientific literature by Confalonieri et al. (2007:393), the effects of climate change to date have been small, but are projected to progressively increase in all countries and regions. A 2013 study found that significant climatic changes were associated with a higher risk of conflict worldwide, and predicted that "amplified rates of human conflict could represent a large and critical social impact of anthropogenic climate change in both low- and high-income countries." Similarly, a 2014 study found that higher temperatures were associated with a greater likelihood of violent crime, and predicted that global warming would cause millions of such crimes in the United States alone during the 21st century. Military planners are concerned that global warming is a "threat multiplier". "Whether it is poverty, food and water scarcity, diseases, economic instability, or threat of natural disasters, the broad range of changing climatic conditions may be far reaching. These challenges may threaten stability in much of the world". The total economic impacts from climate change are highly uncertain. With medium confidence, Smith et al. (2001) concluded that world GDP would change by plus or minus a few percent for a small increase in global mean temperature (up to around 2 °C relative to the 1990 temperature level). Most studies assessed by Smith et al. (2001) projected losses in world GDP for a medium increase in global mean temperature (above 2-3 °C relative to the 1990 temperature level), with increasing losses for greater temperature increases. This assessment is consistent with the findings of more recent studies, as reviewed by Hitz and Smith (2004). Economic impacts are expected to vary regionally. For a medium increase in global mean temperature (2-3 °C of warming, relative to the average temperature between 1990–2000), market sectors in low-latitude and less-developed areas might experience net costs due to climate change. On the other hand, market sectors in high-latitude and developed regions might experience net benefits for this level of warming. A global mean temperature increase above about 2-3 °C (relative to 1990-2000) would very likely result in market sectors across all regions experiencing either declines in net benefits or rises in net costs. A literature assessment by Fischlin et al. (2007) included a quantitative estimate of the number of species at increased risk of extinction due to climate change. With medium confidence, it was projected that approximately 20 to 30% of plant and animal species assessed so far (in an unbiased sample) would likely be at increasingly high risk of extinction should global mean temperatures exceed a warming of 2 to 3 °C above pre-industrial temperature levels. The uncertainties in this estimate, however, are large: for a rise of about 2 °C the percentage may be as low as 10%, or for about 3 °C, as high as 40%, and depending on biota (all living organisms of an area, the flora and fauna considered as a unit) the range is between 1% and 80%. As global average temperature exceeds 4 °C above pre-industrial levels, model projections suggested that there could be significant extinctions (40-70% of species that were assessed) around the globe. Using the A2 SRES emissions scenario, Schneider et al. (2007):789 found that this effect led to additional warming by the years 2090-2100 (relative to the 1990–2000) of 0.1–1.5 °C. This estimate was made with high confidence. The climate projections made in the IPCC Fourth Assessment Report summarized earlier of 1.1–6.4 °C account for this feedback effect. On the other hand, with medium confidence, Schneider et al. (2007):789 commented that additional releases of GHGs were possible from permafrost, peat lands, wetlands, and large stores of marine hydrates at high latitudes. In some locations and industries global warming may increase productivity, though the IPCC cautions that "Estimates agree on the size of the impact (small relative to economic growth), and 17 of the 20 impact estimates shown in Figure 10-1 are negative. Losses accelerate with greater warming, and estimates diverge." The identified benefits are listed below. Winter deaths might decline as temperatures warm. However, this is disputed for at least some regions. For example  states "Although excess winter deaths evidently do exist, winter cold severity no longer predicts the numbers affected. We conclude that no evidence exists that excess winter deaths in England and Wales will fall if winters warm with climate change." ↑ Joint-statement by leaders of 18 scientific organizations: American Association for the Advancement of Science, American Chemical Society, American Geophysical Union, American Institute of Biological Sciences, American Meteorological Society, American Society of Agronomy, American Society of Plant Biologists, American Statistical Association, Association of Ecosystem Research Centers, Botanical Society of America, Crop Science Society of America, Ecological Society of America, Natural Science Collections, Alliance Organization of Biological Field Stations, Society for Industrial and Applied Mathematics, Society of Systematic Biologists, Soil Science Society of America, University Corporation for Atmospheric Research (October 21, 2009), Joint-statement on climate change by leaders of 18 scientific organizations (PDF), Washington DC, USA: American Association for the Advancement of Science CS1 maint: Multiple names: authors list (link). Archived 14 July 2014. ↑ Greenhouse Gas Concentrations and Climate Implications, p.14, in Prinn & Reilly 2014. The range given by Prinn and Reilly is 3.3 to 5.5 °C, with a median of 3.9 °C. ↑ SPM.3 Trends in stocks and flows of greenhouse gases and their drivers, in: Summary for Policymakers, p.8 (archived 2 July 2014), in IPCC AR5 WG3 2014. 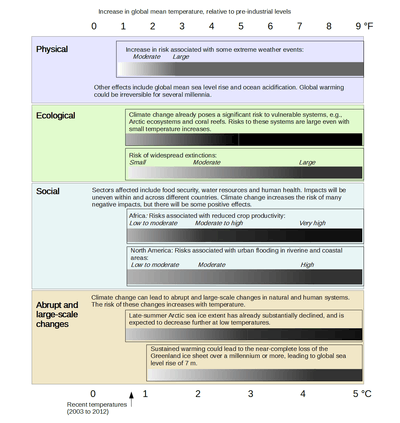 The range given by the Intergovernmental Panel on Climate Change is 3.7 to 4.8 °C, relative to pre-industrial levels (2.5 to 7.8 °C including climate uncertainty). ↑ US Environmental Protection Agency (US EPA) (14 June 2012), Climate Change Science Overview, US EPA, Click on the image to open a pop-up that explains the differences between climate change and global warming. ↑ Pielke, Roger; Gwyn Prins; Steve Rayner; Daniel Sarewitz (2007-02-08). "Lifting the taboo on adaptation" (PDF). Nature. 445: 597–8. doi:10.1038/445597a. Retrieved 2012-08-09. ↑ "Definition of Anthropogenic Forcing – Chemistry Dictionary and Glossary". 1 2 Herring, D. (March 6, 2012). "ClimateWatch Magazine » Global Temperature Projections". NOAA Climate Portal. 1 2 3 4 Schneider; et al., "Chapter 19: Assessing key vulnerabilities and the risk from climate change", Sec. 19.3.1 Introduction to Table 19.1 Missing or empty |title= (help), in IPCC AR4 WG2 2007. 1 2 3 IPCC, "Summary for Policymakers", Sec. 1. 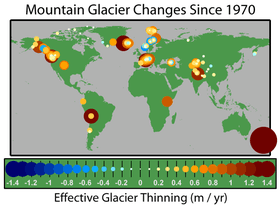 Observed changes in climate and their effects Missing or empty |title= (help), p. 5, in IPCC AR4 SYR 2007. ↑ Morita; et al., "Chapter 2, Greenhouse Gas Emission Mitigation Scenarios and Implications", Sec. 2.5.1.1 IPCC Emissions Scenarios and the SRES Process Missing or empty |title= (help), in IPCC TAR WG3 2001. ↑ IPCC, "Synthesis report", Sec. 3.1 Emissions scenarios Missing or empty |title= (help), in IPCC AR4 SYR 2007. 1 2 3 4 IPCC, "Summary for Policymakers", Sec. 1 3. Projected climate change and its impacts: Table SPM.1 Missing or empty |title= (help), in IPCC AR4 SYR 2007. ↑ Morita; et al., "Chapter 2, Greenhouse Gas Emission Mitigation Scenarios and Implications", Sec. 2.5.1.4 Emissions and Other Results of the SRES Scenarios Missing or empty |title= (help), in IPCC TAR WG3 2001. 1 2 3 4 5 6 7 8 9 Solomon; et al., "Technical Summary", Box TS.1: Treatment of Uncertainties in the Working Group I Assessment Missing or empty |title= (help), in IPCC AR4 WG1 2007. 1 2 Solomon, S.; et al. (January 28, 2009). "Irreversible climate change due to carbon dioxide emissions" (PDF). Proceedings of the National Academy of Sciences of the United States of America. US National Academy of Sciences. 106 (6): 1704–9. Bibcode:2009PNAS..106.1704S. doi:10.1073/pnas.0812721106. PMC 2632717 . PMID 19179281. 1 2 Jansen; et al., "Chapter 6: Palaeoclimate", Sec. 6.3.2 What Does the Record of the Mid-Pliocene Show? Missing or empty |title= (help), in IPCC AR4 WG1 2007. ↑ Solomon; et al., "Technical Summary", TS.3.4 Consistency Among Observations Missing or empty |title= (help), in IPCC AR4 WG1 2007. 1 2 3 4 5 Rosenzweig; et al., "Chapter 1: Assessment of Observed Changes and Responses in Natural and Managed Systems", Executive summary Missing or empty |title= (help), in IPCC AR4 WG2 2007. 1 2 3 Hegerl; et al., "Chapter 9: Understanding and Attributing Climate Change", Executive Summary Missing or empty |title= (help), in IPCC AR4 WG1 2007. ↑ IPCC, "Summary for Policymakers", Human and Natural Drivers of Climate Change Missing or empty |title= (help), in IPCC AR4 WG1 2007. ↑ IPCC, "Summary for Policymakers", Sec. 3. Projected climate change and its impacts Missing or empty |title= (help), in IPCC AR4 SYR 2007. ↑ ESRL web team (26 January 2009). "ESRL News: New Study Shows Climate Change Largely Irreversible" (Press release). US Department of Commerce, NOAA, Earth System Research Laboratory (ESRL). 1 2 3 4 IPCC, "Summary for Policymakers", Magnitudes of impact Missing or empty |title= (help), p.17, IPCC AR4 WG2 2007. ↑ Executive Summary (PHP). Abrupt Climate Change: Inevitable Surprises. United States National Academy of Sciences. June 2002. ↑ Le Treut; et al., "Chapter 1: Historical Overview of Climate Change Science", FAQ 1.2 What is the Relationship between Climate Change and Weather? Missing or empty |title= (help), in IPCC AR4 WG1 2007. 1 2 3 4 NOAA (February 2007), "Will the wet get wetter and the dry drier?" 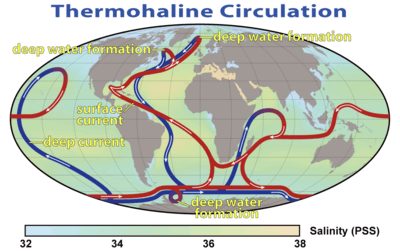 (PDF), GFDL Climate Modeling Research Highlights, Princeton, NJ, USA: National Oceanic and Atmospheric Administration (NOAA) Geophysical Fluid Dynamics Laboratory (GFDL), 1 (5) . Revision 10/15/2008, 4:47:16 PM. 1 2 3 4 5 Confalonieri; et al., "Chapter 8: Human health", Executive summary Missing or empty |title= (help), in IPCC AR4 WG2 2007. ↑ IPCC, "Summary for Policymakers", Question 4 Missing or empty |title= (help), p.14, in IPCC TAR SYR 2001. 1 2 IPCC, "Synthesis Report, Topic 5: The long-term perspective", Sec. 5.2 Key vulnerabilities, impacts and risks – long-term perspectives Missing or empty |title= (help), pp. 64–65, in IPCC AR4 SYR 2007. ↑ State of the Climate in 2009, as appearing in the July 2010 issue (Vol. 91) of the Bulletin of the American Meteorological Society (BAMS). Supplemental and Summary Materials: Report at a Glance: Highlights. Website of the US National Oceanic and Atmospheric Administration: National Climatic Data Center. July 2010. Retrieved 2011-06-06. 1 2 IPCC, "Synthesis Report", Sec. 3.3.4 Ocean acidification Missing or empty |title= (help), in IPCC AR4 SYR 2007. ↑ Fischlin; et al., "Chapter 4: Ecosystems, their properties, goods, and services", Executive summary [??] Missing or empty |title= (help), p. 213, in IPCC AR4 WG2 2007. ↑ Crowley, T. J.; North, G. R. (May 1988). 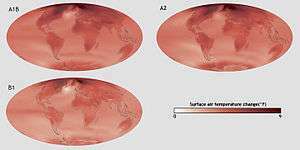 "Abrupt Climate Change and Extinction Events in Earth History". Science. 240 (4855): 996–1002. Bibcode:1988Sci...240..996C. doi:10.1126/science.240.4855.996. PMID 17731712. ↑ Shaffer, G. .; Olsen, S. M.; Pedersen, J. O. P. (2009). "Long-term ocean oxygen depletion in response to carbon dioxide emissions from fossil fuels". Nature Geoscience. 2 (2): 105–109. Bibcode:2009NatGe...2..105S. doi:10.1038/ngeo420. ↑ US Environmental Protection Agency (US EPA) (2010). "Sea Level: Climate Change: US EPA". US EPA. 1 2 Bindoff; et al., "Chapter 5: Observations: Oceanic Climate Change and Sea Level", FAQ 5.1 Is Sea Level Rising? Missing or empty |title= (help), in IPCC AR4 WG1 2007. ↑ Bindoff; et al., "Chapter 5: Observations: Oceanic Climate Change and Sea Level", Executive summary Missing or empty |title= (help), in IPCC AR4 WG1 2007. ↑ Albritton; et al., "Technical Summary", Box 2: What causes sea level to change? Missing or empty |title= (help), in IPCC TAR WG1 2007. ↑ "7 Sea Level Rise and the Coastal Environment", http://books.nap.edu/openbook.php?record_id=12782&page=245 Missing or empty |title= (help), in NRC 2010, p. 245. ↑ IPCC, "Section 3: Projected climate change and its impacts", Table SPM.1 Missing or empty |title= (help), in IPCC AR4 SYR 2007. ↑ Meehl; et al., "Chapter 10: Global Climate Projections", Executive summary Missing or empty |title= (help), in IPCC AR4 WG1 2007. 1 2 3 4 "7 Sea Level Rise and the Coastal Environment", pp. 243–245 http://books.nap.edu/openbook.php?record_id=12782&page=243 Missing or empty |title= (help), in US NRC 2010. ↑ Bindoff; et al., "Chapter 5: Observations: Oceanic Climate Change and Sea Level", Missing or empty |title= (help), in IPCC AR4 WG1 2007. ↑ Gille, Sarah T. (February 15, 2002). "Warming of the Southern Ocean Since the 1950s". Science. 295 (5558): 1275–7. Bibcode:2002Sci...295.1275G. doi:10.1126/science.1065863. PMID 11847337. ↑ US Environmental Protection Agency (14 June 2012). "Science: Climate Change: US EPA (Climate Change Science Overview)". US EPA. 1 2 Rosenzweig, C. (December 2008). "Science Briefs: Warming Climate is Changing Life on Global Scale". Website of the US National Aeronautics and Space Administration, Goddard Institute for Space Studies. Retrieved 2011-07-08. ↑ IPCC, "Summary for Policymakers", Projections of Future Changes in Climate Missing or empty |title= (help), in IPCC AR4 WG1 2007. ↑ IPCC, "Synthesis Report", Question 9: Table SPM-3 Missing or empty |title= (help), in IPCC TAR SYR 2001. 1 2 IPCC, "Synthesis report", Sec. 3.3.3 Especially affected systems, sectors and regions Missing or empty |title= (help), in IPCC AR4 SYR 2007. ↑ IPCC, Glossary P-Z: "sensitivity" and "vulnerability" , in IPCC AR4 WG2 2007. ↑ IPCC, "Summary for Policymakers", Sec. 2.4. Many Human Systems are Sensitive to Climate Change, and Some are Vulnerable Missing or empty |title= (help), in IPCC TAR WG2 2001. ↑ Schneider; et al., "Chapter 19: Assessing key vulnerabilities and the risk from climate change", 19.3.2.2 Other market sectors Missing or empty |title= (help), in IPCC AR4 WG2 2007. ↑ Easterling; et al., "Chapter 5: Food, Fibre, and Forest Products", 5.4.1 Primary effects and interactions Missing or empty |title= (help), in IPCC AR4 WG2 2007, p. 282. 1 2 3 Schneider; et al., "Chapter 19: Assessing Key Vulnerabilities and the Risk from Climate Change", Sec. 19.3.2.1 Agriculture Missing or empty |title= (help), in IPCC AR4 WG2 2007, p. 790. ↑ Rosenzweig; et al., "Chapter 1: Assessment of Observed Changes and Responses in Natural and Managed Systems", Sec. 1.3.6.1 Crops and livestock Missing or empty |title= (help), in IPCC AR4 WG2 2007. ↑ IPCC, Glossary P-Z: "phenology" , in IPCC AR4 WG2 2007. ↑ Schneider, S.H. ; et al., "Chapter 19: Assessing Key Vulnerabilities and the Risk from Climate Change", Box 19.2. Reference for temperature levels Missing or empty |title= (help), in IPCC AR4 WG2 2007, p. 783. ↑ Easterling; et al., "Chapter 5: Food, Fibre, and Forest Products", Sec. 5.6.5 Food security and vulnerability Missing or empty |title= (help), in IPCC AR4 WG2 2007. ↑ "World hunger increasing". Food and Agriculture Organization (FAO) Newsroom. 30 October 2006. Retrieved 2011-07-07. ↑ Dai, A. (2011). "Drought under global warming: A review". Wiley Interdisciplinary Reviews: Climate Change. 2: 45–65. doi:10.1002/wcc.81. ↑ Sheffield, J.; Wood, E. F.; Roderick, M. L. (2012). 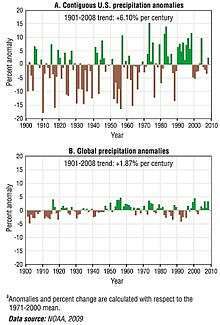 "Little change in global drought over the past 60 years". Nature. 491 (7424): 435–438. Bibcode:2012Natur.491..435S. doi:10.1038/nature11575. ↑ Mishra, A. K.; Singh, V. P. (2011). "Drought modeling – A review". Journal of Hydrology. 403: 157–175. Bibcode:2011JHyd..403..157M. doi:10.1016/j.jhydrol.2011.03.049. ↑ Ding, Y.; Hayes, M. J.; Widhalm, M. (2011). 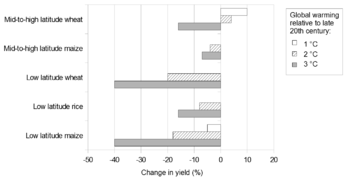 "Measuring economic impacts of drought: A review and discussion". Disaster Prevention and Management. 20 (4): 434–446. doi:10.1108/09653561111161752. ↑ WHO (2009). "Ch. 2, Results: 2.6 Environmental risks" (PDF). Global health risks: mortality and burden of disease attributable to selected major risks (PDF). Geneva, Switzerland: WHO Press. p. 24. ISBN 978 92 4 156387 1. 1 2 IPCC AR4 SYR 2007. 1 2 Confalonieri; et al., "Chapter 8: Human health", Sec. 8.3.2 Future vulnerability to climate change Missing or empty |title= (help), in IPCC AR4 WG2 2007. ↑ Kundzewicz; et al., "Chapter 3: Fresh Water Resources and their Management", Sec. 3.2 Current sensitivity/vulnerability Missing or empty |title= (help), in IPCC AR4 WG2 2007. 1 2 Kundzewicz; et al., "Chapter 3: Fresh Water Resources and their Management", Sec. 3.3 Executive summary Missing or empty |title= (help), p. 175, in IPCC AR4 WG2 2007. 1 2 Scott; et al., "Chapter 12: Human settlements in a changing climate: impacts and adaptation", Sec. 12.3.1 Population Migration Missing or empty |title= (help), pp. 406—407, in IPCC SAR WG2 1996. 1 2 The World Bank, "Part One: Chapter 2: Reducing Human Vulnerability: Helping People Help Themselves" (PDF), Managing social risks: Empower communities to protect themselves , p. 109, WDR 2010. ↑ Desanker; et al., "Chapter 10: Africa", Executive summary Missing or empty |title= (help), in IPCC TAR WG2 2001. 1 2 Scott; et al., "Chapter 7: Human Settlements, Energy, and Industry", Sec. 7.2.2.3.1. Migration Missing or empty |title= (help), in IPCC TAR WG2 2001. ↑ Wilbanks; et al., "Chapter 7: Industry, settlement and society", Sec. 7.4.1 General effects: Box 7.2. Environmental migration Missing or empty |title= (help), in IPCC AR4 WG2 2007. ↑ Hsiang SM, Burke M, Miguel E (September 2013). "Quantifying the influence of climate on human conflict". Science. 341 (6151): 1235367. doi:10.1126/science.1235367. PMID 24031020. ↑ Ranson, M. (2014). "Crime, weather, and climate change". Journal of Environmental Economics and Management. 67: 274–302. doi:10.1016/j.jeem.2013.11.008. ↑ Spaner, J S; LeBali, H (October 2013). "The Next Security Frontier". Proceedings of the US Naval Institute. 139 (10): 30–35. Retrieved 23 Nov 2015. ↑ Smith; et al., "Chapter 19: Vulnerability to Climate Change and Reasons for Concern: A Synthesis", Sec. 19.5.3 Insights and Lessons: Vulnerability over Time: Table 19-5 Missing or empty |title= (help), in IPCC TAR WG2 2001. ↑ Smith; et al., "Chapter 19: Vulnerability to Climate Change and Reasons for Concern: A Synthesis", Sec. 19.5.2. Insights and Lessons: The Static Picture Missing or empty |title= (help), in IPCC TAR WG2 2001. ↑ Rosenzweig; et al., "Chapter 1: Assessment of observed changes and responses in natural and managed systems", Sec. 1.3.8.5 Summary of disasters and hazards Missing or empty |title= (help), in IPCC AR4 WG2 2007. 1 2 3 IPCC, "Synthesis Report", Question 2, Sections 2.25 and 2.26 Missing or empty |title= (help), p. 55, IPCC TAR SYR 2001. ↑ Schneider; et al., "Chapter 19: Assessing key vulnerabilities and the risk from climate change", Sec. 19.3.2.3 Aggregate market impacts Missing or empty |title= (help), p. 790, in IPCC AR4 WG2 2007. 1 2 Smith; et al., "Chapter 19: Vulnerability to Climate Change and Reasons for Concern: A Synthesis", Sec. 19.8.2.3. Aggregate Impacts Missing or empty |title= (help), in IPCC TAR WG2 2001. 1 2 3 4 Schneider; et al., "Chapter 19: Assessing key vulnerabilities and the risk from climate change", Sec. 19.3.7 Update on ‘Reasons for Concern’ Missing or empty |title= (help), p. 796, in IPCC AR4 WG2 2007. ↑ Smith; et al., "Chapter 19: Vulnerability to Climate Change and Reasons for Concern: A Synthesis", Sec. 19.4.3. Distribution of Total Impacts Missing or empty |title= (help), in IPCC TAR WG2 2001. ↑ NRC 2008b. "Introduction". Ecological Impacts of Climate Change. p. 14. 1 2 NRC 2008b. "Introduction". Ecological Impacts of Climate Change. p. 16. 1 2 3 Fischlin; et al., "Chapter 4: Ecosystems, their properties, goods and services", Executive summary Missing or empty |title= (help), pp. 213–214, in IPCC AR4 WG2 2007. 1 2 IPCC, "Synthesis Report, Question 3", Sec. 3.18 http://www.grida.no/climate/ipcc_tar/vol4/english/026.htm Missing or empty |title= (help), in IPCC TAR SYR 2001. ↑ Van Riper, Charles. (2014) Projecting Climate Effects on Birds and Reptiles of the Southwestern United States. Reston, Va.: U.S. Department of the Interior, U.S. Geological Survey. 1 2 3 4 5 Fischlin; et al., "Chapter 4: Ecosystems, their properties, goods and services", Sec. 4.4.11 Global synthesis including impacts on biodiversity Missing or empty |title= (help), in IPCC AR4 WG2 2007. ↑ IPCC, Glossary A-D: "biota" , in IPCC AR4 WG2 2007. ↑ NRC, "Introduction", Ecological Impacts of Climate Change, p. 16 , in NRC 2008b. ↑ IPCC, "Section 3: Projected climate change and its impacts", Sec. 3.3 Impacts of future climate changes Missing or empty |title= (help), in IPCC AR4 SYR 2007. ↑ IPCC, "Section 3: Projected climate change and its impacts", Sec. 3.3.1 Impacts on systems and sectors: Ecosystems Missing or empty |title= (help), in IPCC AR4 SYR 2007. 1 2 3 Smith; et al., "Chapter 19: Vulnerability to Climate Change and Reasons for Concern: A Synthesis", Sec. 19.8.2.5. Large-Scale Singularities Missing or empty |title= (help), in IPCC TAR WG2 2001. 1 2 White; et al., "Technical summary", Sec. 7.2.5, Large-Scale Singular Events Missing or empty |title= (help), in IPCC TAR WG2 2001. ↑ "[F]or the most part" refers to improved scientific understanding of singularities since the assessment by White et al. (2001). See: Schneider; et al., "Chapter 19: Assessing key vulnerabilities and the risk from climate change", Sec. 19.3.7 Update on ‘Reasons for Concern’ Missing or empty |title= (help), in IPCC AR4 WG2 2007. 1 2 3 Schneider; et al., "Chapter 19: Assessing key vulnerabilities and the risk from climate change", Sec. ??? Missing or empty |title= (help), in IPCC AR4 WG2 2007. ↑ Riebeek, H.. design by R. Simmon (May 9, 2006). "Paleoclimatology: Explaining the Evidence: Explaining Rapid Climate Change: Tales from the Ice". NASA Earth Observatory. Retrieved 2011-10-16. 1 2 3 4 5 CCSP (2008b). Abrupt Climate Change. A report by the US Climate Change Science Program (CCSP) and the Subcommittee on Global Change Research. Reston, VA: US Geological Survey. ↑ Schneider; et al., "Chapter 19: Assessing key vulnerabilities and the risk from climate change", Sec. 19.3.5.3 Possible changes in the North Atlantic meridional overturning circulation (MOC) Missing or empty |title= (help), in IPCC AR4 WG2 2007. 1 2 Albritton; et al., "Technical Summary", Sec. C.1 Observed Changes in Globally Well-Mixed Greenhouse Gas Concentrations and Radiative Forcing Missing or empty |title= (help), p. 38, in IPCC TAR WG1 2001. ↑ IPCC, "Summary for Policymakers", Sec. 2. Causes of change Missing or empty |title= (help), p. 5, in IPCC AR4 SYR 2007. ↑ Meehl; et al. "Chapter 10: Global Climate Projections". Frequently Asked Question 10.3: If Emissions of Greenhouse Gases are Reduced, How Quickly do Their Concentrations in the Atmosphere Decrease?. Missing or empty |title= (help), in IPCC AR4 WG1 2007. 1 2 Barker; et al., "Chapter 11: Mitigation from a cross-sectoral perspective", Executive summary - Unconventional options Missing or empty |title= (help) , in IPCC AR4 WG3 2007. ↑ IPCC, "5.14", Question 5 http://www.grida.no/climate/ipcc_tar/vol4/english/044.htm Missing or empty |title= (help), in IPCC TAR SYR 2001. 1 2 3 4 Schneider; et al., "Chapter 19: Assessing key vulnerabilities and the risk from climate change", Sec.19.2 Criteria for selecting ‘key’ vulnerabilities: Persistence and reversibility Missing or empty |title= (help), in IPCC AR4 WG2 2007. ↑ Molina & others n.d.
↑ For example: Good & others (2010). Refer to UKMO (2013) for other AVOID publications. ↑ "NASA Releases Detailed Global Climate Change Projections". Retrieved 2015-06-09. 1 2 IPCC, "Synthesis Report", Question 2, Box 2-1 Missing or empty |title= (help), IPCC TAR SYR 2001. ↑ White; et al., "Technical Summary", Box 2. Confidence Levels and State of Knowledge Missing or empty |title= (help), in IPCC TAR WG2 2001. ↑ Ahmad; et al., "Chapter 2: Methods and Tools", Sec. 2.6.2. "Objective" and "Subjective" Probabilities are not Always Explicitly Distinguished Missing or empty |title= (help), in IPCC TAR WG2 2001. 1 2 3 Granger Morgan, M. (Lead Author), H. Dowlatabadi, M. Henrion, D. Keith, R. Lempert, S. McBride, M. Small and T. Wilbanks (Contributing Authors) (2009). Synthesis and Assessment Product 5.2: Best practice approaches for characterizing, communicating, and incorporating scientific uncertainty in decisionmaking. A Report by the U.S. Climate Change Science Program and the Subcommittee on Global Change Research. Washington D.C., USA. : National Oceanic and Atmospheric Administration. pp. 19–20; 27–28. CS1 maint: Multiple names: authors list (link) Tables 2.1 and 2.2 on pages 27-28 show two quantitative scales of uncertainty which are used in the TAR and AR4. Allison, I.; et al. (2009), The Copenhagen Diagnosis, 2009: Updating the world on the Latest Climate Science, Sydney, Australia: The University of New South Wales Climate Change Research Centre (CCRC), retrieved 8 June 2014 . Archived 7 March 2014. Committee on Ecological Impacts of Climate Change, US National Research Council (NRC) (2008). Ecological Impacts of Climate Change. 500 Fifth Street, NW Washington, DC 20001, USA: The National Academies Press. ISBN 978-0-309-12710-3. IPCC SAR WG2 (1996), Watson, R.T.; Zinyowera, M.C. ; Moss, R.H., eds., Climate Change 1995: Impacts, Adaptations and Mitigation of Climate Change: Scientific-Technical Analyses, Contribution of Working Group II to the Second Assessment Report of the Intergovernmental Panel on Climate Change, Cambridge University Press, ISBN 0-521-56431-X (pb: 0-521-56437-9 pdf. IPCC TAR SYR (2001), Watson, R. T.; the Core Writing Team, eds., Climate Change 2001: Synthesis Report, Contribution of Working Groups I, II, and III to the Third Assessment Report of the Intergovernmental Panel on Climate Change, Cambridge University Press, ISBN 0-521-80770-0 (pb: 0-521-01507-3). IPCC AR4 SYR (2007), Core Writing Team; Pachauri, R.K; Reisinger, A., eds., Climate Change 2007: Synthesis Report, Contribution of Working Groups I, II and III to the Fourth Assessment Report of the Intergovernmental Panel on Climate Change, Geneva, Switzerland: IPCC, ISBN 92-9169-122-4 . IPCC SREX (2012), Field, C.B. et al., eds., Managing the Risks of Extreme Events and Disasters to Advance Climate Change Adaptation (SREX), Cambridge University Press CS1 maint: Uses editors parameter (link). Summary for Policymakers available in Arabic, Chinese, French, Russian, and Spanish. IPCC AR5 WG2 A (2014), Field, C.B. ; et al., eds., Climate Change 2014: Impacts, Adaptation, and Vulnerability. Part A: Global and Sectoral Aspects. Contribution of Working Group II (WG2) to the Fifth Assessment Report (AR5) of the Intergovernmental Panel on Climate Change (IPCC), Cambridge University Press . Archived 20 October 2014. IPCC AR5 WG3 (2014), Edenhofer, O.; et al., eds., Climate Change 2014: Mitigation of Climate Change. Contribution of Working Group III (WG3) to the Fifth Assessment Report (AR5) of the Intergovernmental Panel on Climate Change (IPCC), Cambridge University Press . Archived 29 June 2014. IPCC press release (31 March 2014), Press Release: IPCC Report: A changing climate creates pervasive risks but opportunities exist for effective responses - Responses will face challenges with high warming of the climate (PDF), IPCC, retrieved 29 May 2014 . Archived file. Also available in Arabic, Chinese, French, Russian and Spanish. Molina, M.; et al. (n.d.), What We Know: The Reality, Risks and Response to Climate Change. A report by the American Association for the Advancement of Science (AAAS) Climate Science Panel (PDF), AAAS, retrieved 6 June 2014 . Archived 5 June 2014. Report website (archived 6 June 2014). PBL; et al. (November 2009), News in climate science and exploring boundaries: A Policy brief on developments since the IPCC AR4 report in 2007. A report by the Netherlands Environmental Assessment Agency (PBL), Royal Netherlands Meteorological Institute (KNMI), and Wageningen University and Research Centre (WUR) (PDF), Bilthoven, Netherlands: PBL . Archived 1 May 2014. Report website (Archived 1 May 2014). Prinn, R.G. ; J.M. Reilly (2014), 2014 Energy and Climate Outlook (PDF), Cambridge, MA, USA: MIT Joint Program on the Science and Policy of Global Change . Archived 22 October 2014. Report website (archived 2 November 2014). UKMO (18 September 2013), AVOID Reports, UK Meteorological Office (UKMO), retrieved 8 June 2014 . Archived 8 June 2014. UK Royal Society and US National Academy of Sciences (2014), Climate Change: Evidence and Causes (PDF), retrieved 8 June 2014 . Archived 7 March 2014. Report website (archived 31 May 2014). Staff of the International Bank for Reconstruction and Development / The World Bank (2010). World Development Report 2010: Development and Climate Change. 1818 H Street NW, Washington DC 20433, USA: International Bank for Reconstruction and Development / The World Bank. doi:10.1596/978-0-8213-7987-5. ISBN 978-0-8213-7987-5. US NRC (2010). Advancing the Science of Climate Change. A report by the US National Research Council (NRC). Washington, D.C., USA: National Academies Press. ISBN 0-309-14588-0. . Archived 29 May 2014. US NRC (2011), Climate Stabilization Targets: Emissions, Concentrations, and Impacts over Decades to Millennia. A report by the US National Research Council (NRC), Washington, D.C., USA: National Academies Press Archived 27 March 2014. "Climate Change". World Meteorological Organization. The IPCC Working Group II (WG II) website – This body assesses the vulnerability of socio-economic and natural systems to climate change, negative and positive consequences of climate change, and options for adapting to it. IRIN, the humanitarian news and analysis service of the UN Office for the Coordination of Humanitarian Affairs: "What climate change does", "How climate change works", and "Gathering Storm - the humanitarian impact of climate change"